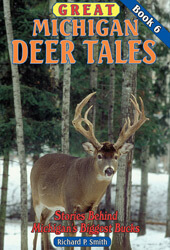 The number of requests for Book 6 of Great Michigan Deer Tales have become too numerous to ignore. 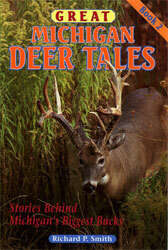 So, due to popular demand, the latest collection of short stories about the state’s biggest bucks is now available. Boone and Crockett bucks from every region of the state are covered, including the highest scoring nontypical ever recorded in Michigan along with the highest scoring 8-pointer taken by a bowhunter. 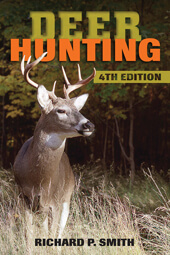 One of the chapters in this book is devoted to state record deer taken with crossbows, but those claimed with vertical bows, muzzleloaders and centerfire firearms are also covered. One chapter you won’t want to miss explains how a spikehorn was just as memorable, if not more so, for one hunter than the booner he bagged. 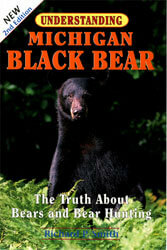 You will also want to read the chapter about the hunter who has 31 bucks in state records, including a number of booners. A digital version of this book (ebook) can be found on Amazon, Barnes & Noble, iTunes, Google Play and Kobo websites. 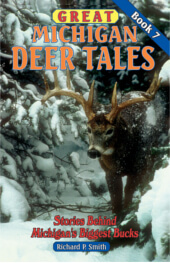 Great Michigan Deer Tales Sets. Choose how many books you want in the set and save. If you already have a few of the books in the set, complete it by ordering the ones you don’t already own. The more books you get the cheaper they are per book. Get 2 for $ 28, 3 for $40, 4 for $50, 5 for $60, 6 for $72 and all 7 for $82. Check out our other books in the series!